NOTE: Please scroll down the page to view all items. 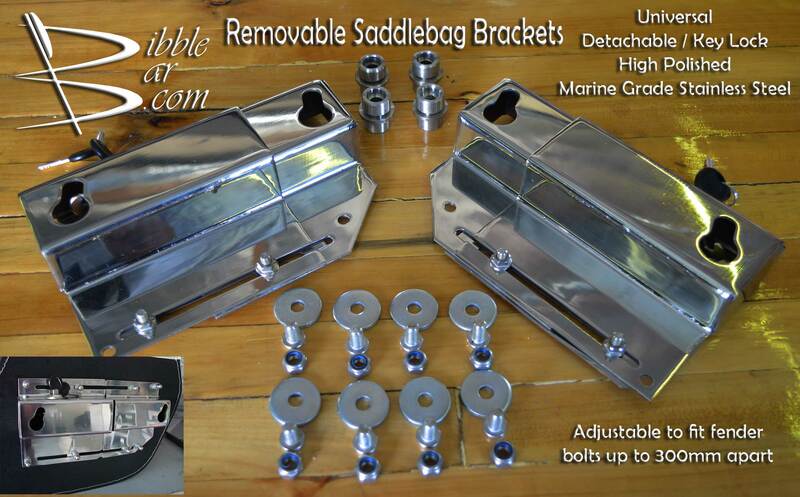 These are made from Marine Grade High Polished Stainless Steel and because of our universal design, can be made to fit any cruiser that has two fender bolts on each side. 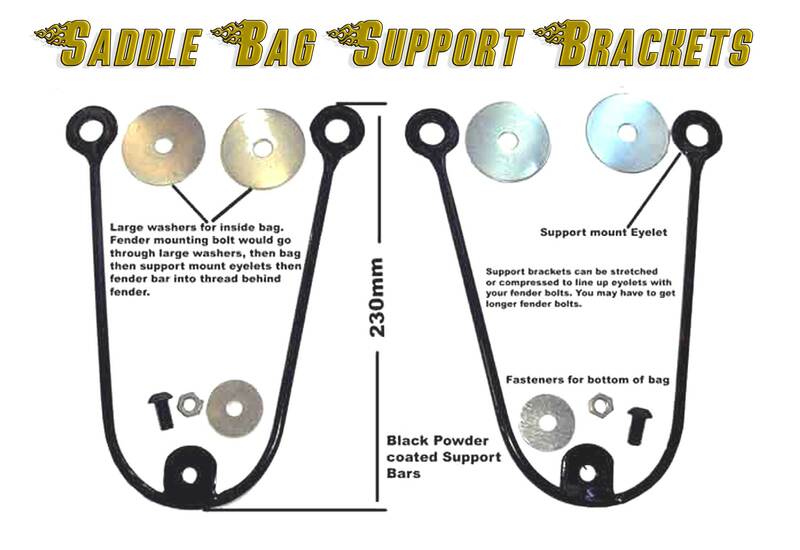 You will need to purchase cup head bolts 30mm longer than your existing fender bolts. $1.50 each at any Nut and bolt shop.Everything else is included. Even the nuts and bolts to mount to your saddle bags. Only the stainless steel docking post remain on your bike when bags are removed. Makes it much easier to clean your bike when the bags are off. 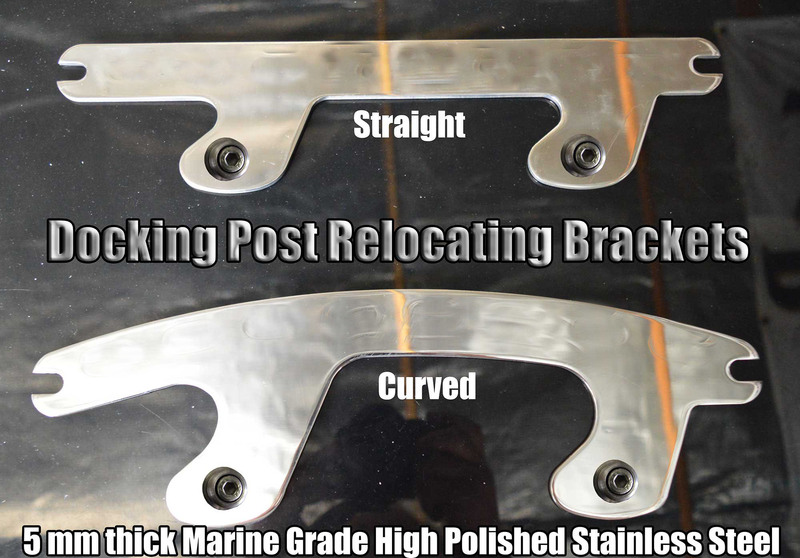 NOTE –These are not Easy brackets or Edge brackets, which are a similar USA system made of powder coated steel. The problem is, the powder coat wears off from sliding them on and off the docking post which exposes the steel. We all know what happens then!! Ours will last forever!! 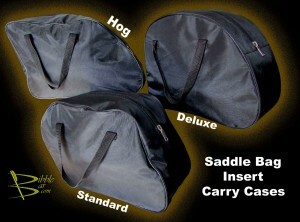 Price is $225 or $200 with purchase of saddle bags. These are like a heavy Nylon gym bag only shaped to our three different Saddle Bag designs. Also double assures that your gear stays dry. 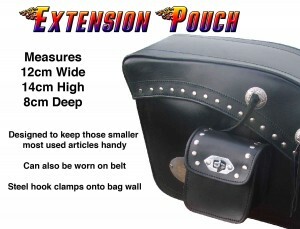 $45.00 a pair with saddle bags order. Handy for those quick to get at items. It just loop over the edge of an open bag and becomes secure when you close the lid. They also can go on your belt. They come as pair. For those of you who just want a quick and easy solution to carrying items. The Throw-Over-Kit comes with everything you see in the photo. 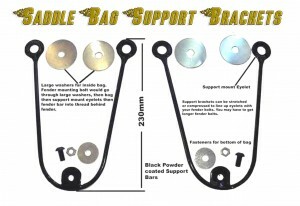 Just bolt the D-Rings onto your bags, lace up the throw over strap to suit and Bob’s your uncle. If ordering with bags please select the ‘with bags’ option below. Once again, we saw something over priced and did something about it. 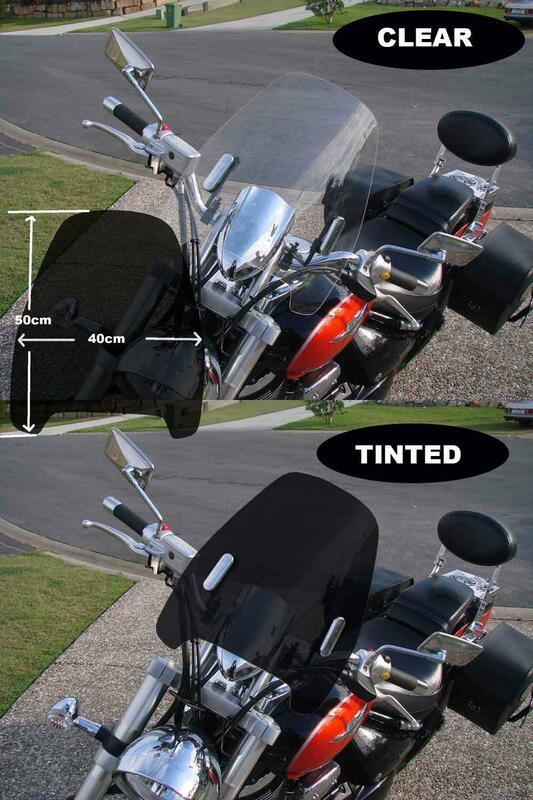 These windscreens are universal, simple to mount on your handlebars. All hardware is included. These will keep the bugs out of your teeth while helping you to loosen your death grip and relax when flying down the highway. They are designed not to interfere with the ride as many do. Although you look over the top of the screen, If your gauges are forward of the windscreen, I recommend clear, as the tint is dark. 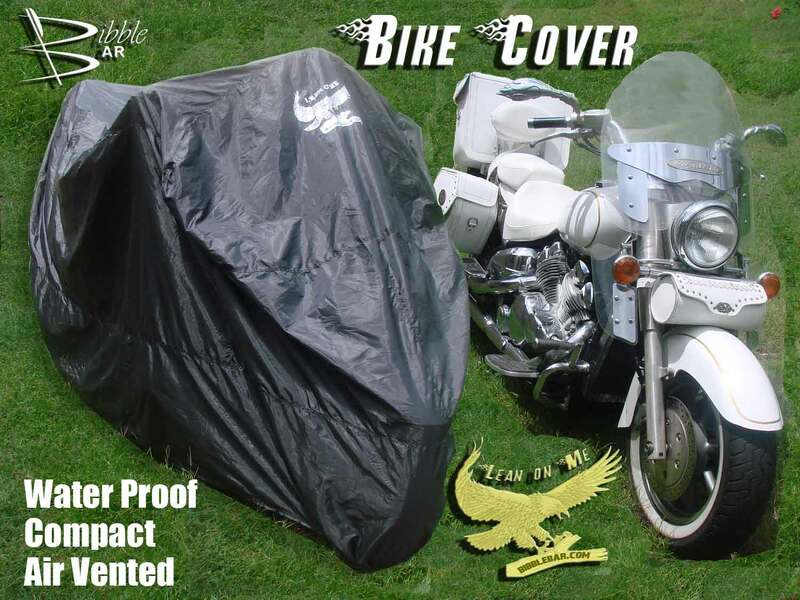 I bought a cover six months ago for double our price. Once again, I thought I could do better for less. Keep it dry if it’s outside, Keep it dust Free if it’s inside. Compact, waterproof and light. Comes in it’s own carry bag. Why Pay extra for a chrome job on something you never see. 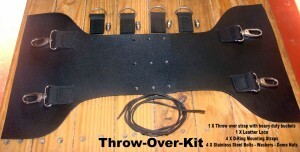 These are designed to fit any cruiser that has two fender bolts on each side of their fender rail. They not only stop your bags from hitting your wheel, they stop bags from going air born and help distribute the weight to more of the bag area. Save yourself a $100 plus. famous. He gave me a recipe, I cooked it up and man this stuff is great. FYI… Don’t ever put a petroleum product on your leathers. than the most expensive lotions from big pharma. 3. I applied it to sun faded rubber and plastics. It blows Armour All away and lasts for weeks. Don’t ever put a petroleum product on your leathers. 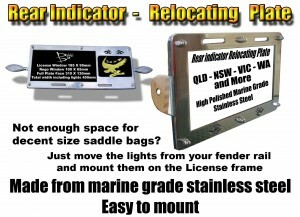 Can’t find a place for your rego on your bike? 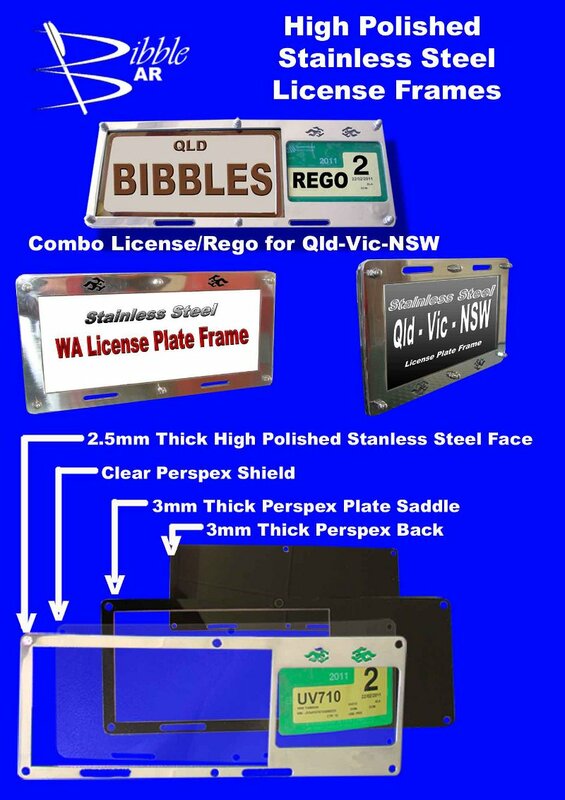 Try our combination License plate and Registration frame.All our plates are cut from Marine Grade Stainless Steel then polished to a Mirror Finish.Unlike chrome or alloy these will never pit, stain or rust. Our four piece system gets away from the old style cheap facade that just covers the front of the plate or sandwiches your plate between two pieces. With a 2.5mm stainless front, followed with a 1mm thick clear Perspex, followed with a 3mm thick Perspex saddle that your plate sits in, then a 3mm thick Perspex backing using stainless steel counter sunk bolts for a flush fit with stainless dome nuts to hold it all together. 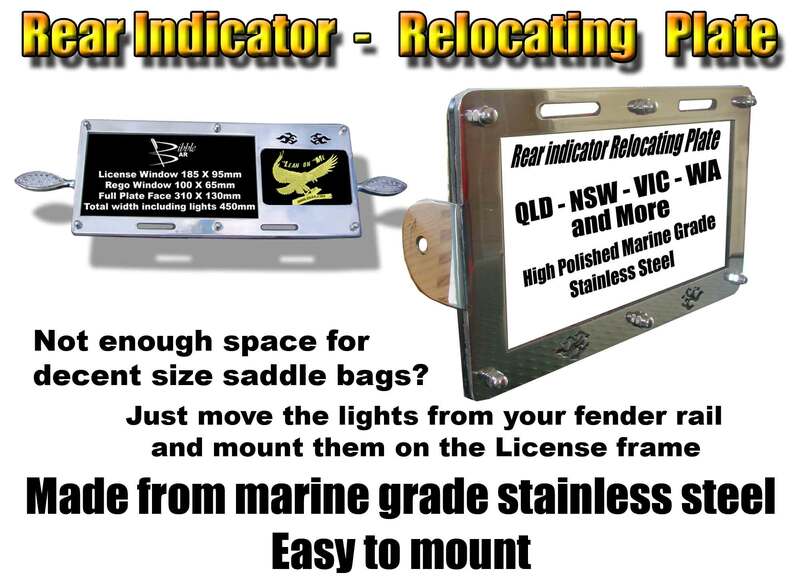 Can’t fit decent size saddle bags on your bike because the rear indicator is located on your fender rail?Here is the easiest way to get around that. 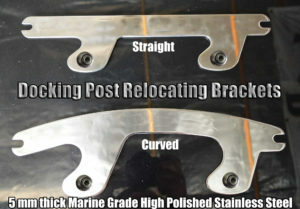 Our Re-locating plate is simple and easy to install. Designed for Queensland but fits most states. If you don’t like the side by side License/Rego design, you can get it minus the rego section. 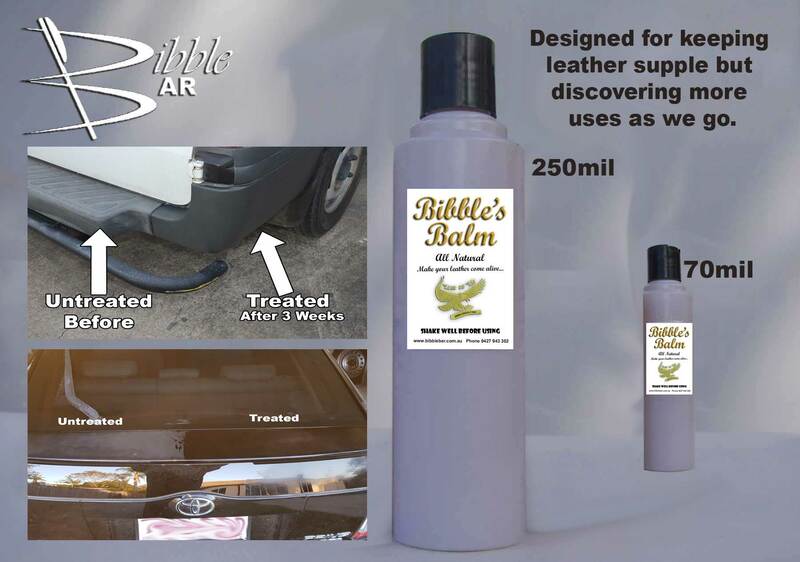 Western Australia has been good to Bibble Bar so, in return, we have covered your 254 X 100mm also.